I have attached some photos for those who have been following our 1960 Chev El Camino build. Rob has completed the colour sanding and the two-tone paint scheme looks spectacular. The top colour is a blue pearl from the PPG Vibrance range, the bottom colour is called parchment with a red paint divider to tie it all together. 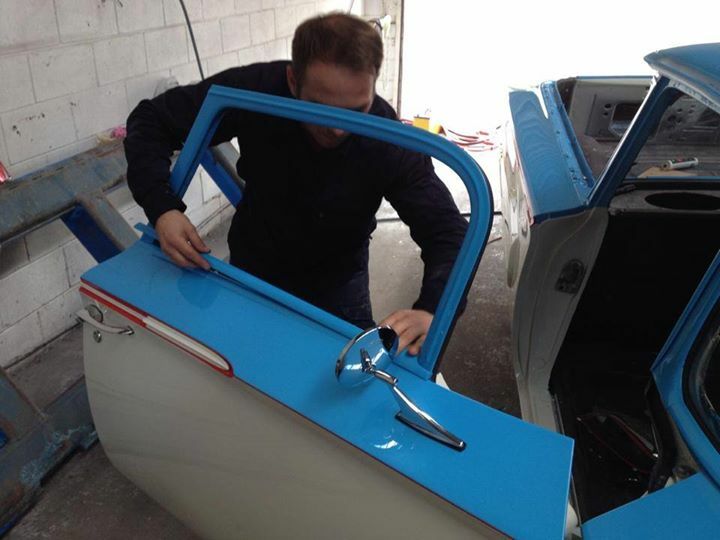 No stainless or chrome trim...trim and bumpers are painted in one the two main colours depending upon location. Rob has now handed the job over to Roland who has the unenviable task of fitting all the trim without scratching Rob's paint! We hope to start on the upholstery soon (leather bench seat and door cards to match the parchment colour and a black carpet and headliner. Roland has also installed a first-class sound system with a retro style head unit. Can't wait for it to be finished.